The Bottom Line: BNC National Bank lets you apply via web or iPhone app. You can’t see interest rates on their website, though. Loan officers experienced with VA loan process. Considers alternative credit data, like cell phone payments. Typically charges a $1,095 lender fee. Limited number of physical mortgage offices. BNC National Bank is a federally chartered bank headquartered in Bismarck, North Dakota. Despite its deep roots in the Peace Garden State, BNC is licensed to lend in all 50 states and regularly works with borrowers from all over the country. As a mortgage lender, BNC strives to combine the personal service of skilled loan officers with the convenience of digital tools. “Technology is a piece of what we do, but it's not the only thing we do. We want to make sure that there's still that human dynamic,” says Michael Zerr, vice president of consumer direct marketing at BNC National Bank. For those looking to purchase a home, BNC has conventional loans with fixed and adjustable rates, jumbo loans up to $3.5 million and energy-efficient mortgages (EEMs). The bank also offers government loan programs from the Federal Housing Administration (FHA), U.S. Department of Veterans Affairs (VA) and U.S. Department of Agriculture (USDA). Zerr says VA loans are something of a specialty at BNC, making up approximately 40% of their loan volume, and points out that the bank does not charge origination fees for VA loans. And while USDA loans aren’t listed on the BNC website, Zerr confirms they are an option, particularly popular at branch offices in the Midwest. Although BNC doesn’t offer construction loans, it does provide FHA 203(k) loans. These home improvement loans make it easier to buy a fixer-upper by rolling the cost of necessary repairs or remodeling into the mortgage payment. BNC doesn’t offer home equity loans or lines of credit at this time, but Zerr says it’s exploring the option of adding them in the future. When asked how borrowers typically start the mortgage process with BNC, Zerr says it’s a “big blend.” Customers seeking a refinance are more likely to complete the process online, while those looking to purchase a house may want to apply over the phone with the help of a loan officer. 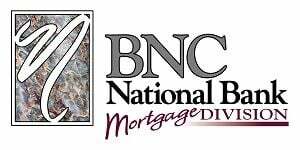 Those who land on the bank’s mortgage website, www.bncnationalbank.com, can start the process by choosing between the "Home Purchase" and "Home Refinance" tabs on the home page. Both options launch a series of questions about the property, your down payment and how soon you plan to buy. There are also some personal questions about credit score, financial history and military service. After submitting your answers, a BNC loan officer will contact you to discuss next steps. BNC offers online pre-qualification, but you’ll have to create an account on its website to provide information about your finances and the home you hope to purchase. Get started by clicking the "Apply Now" button on the site’s home page. Be aware that you may have to verify financial details with a loan officer before getting a pre-qualification letter. Mortgage preapproval, which BNC refers to as a loan commitment, isn’t available online at this time. Zerr says the bank prefers to manually review a borrower’s application before providing proof of preapproval so there aren’t any surprises, but strives to do it as quickly as possible. To help speed things up, income and asset documentation can be uploaded securely via the bank’s website and iPhone app. Once the full application is submitted, BNC provides automatic progress updates via email. If updates contain any confusing or unexpected details, your dedicated loan officer may follow up with a phone call to answer questions directly. Zerr says BNC strives to offer interest rates that are “competitive,” but you don’t find them listed on its mortgage website. The best way to get a customized rate quote is to complete the online application or contact the bank directly for pre-qualification. If you like the quoted rate, BNC will let you lock it in for up to 365 days, with no upfront charge in some cases. Rate "float downs" may be available within 30 days of closing as well. This feature protects you if mortgage rates move higher, but lets you take advantage of a lower interest rate if they drop 0.25% or more after you lock. When it comes to origination fees, Zerr says BNC typically charges $1,095. He adds that conventional borrowers with good credit often qualify for lender credits that may reduce this number. » MORE: When should you lock your mortgage interest rate? Buying a home is always a big financial decision, but the first time can be especially challenging. In addition to loan products known for more relaxed qualification requirements, like FHA, VA and some 3% down conventional loans, the BNC mortgage website also offers a fair amount of educational info. Click the "Mortgage Basics" tab on the site’s home page and you’ll find a mortgage application checklist, detailed descriptions of the appraisal and closing processes and a glossary of mortgage terms, among other resources. The bank participates in first-time home buyer programs offered through some state housing agencies, Zerr says. These programs may provide down payment assistance loans or grants, interest rate discounts or tax credits that make homeownership more affordable for eligible borrowers. Prioritizing customer satisfaction is one way BNC hopes to set itself apart from other national lenders. Zerr says borrowers can expect to deal with a single loan officer throughout the entire process, and on average, that loan officer will have over seven years of experience. BNC staff are expected to have “a really good, succinct knowledge of different locales and climates” so real estate agents can feel more comfortable about their clients using an out-of-state bank. “People are putting their life's biggest decision, in some cases, financially, in the hands of a stranger,” Zerr says. “We take that very seriously and make sure they feel comfortable with [the loan officer] they’re dealing with." BNC has plans to begin official participation in the HUD Section 184 Indian Home Loan Guarantee Program in 2019, Zerr zays. Available to American Indian and Alaska Native families, Alaska villages, tribes or tribally designated housing entities, this program provides mortgages with low down payment requirements and flexible underwriting. Expansion of the bank’s online mortgage capabilities may also be on the horizon, Zerr says.